GASP! I have to do some chatting first before I dive into this post… because I am all about keeping it real (do you follow me on Insta stories or YouTube? then you would know). Well a few months ago my hubby was talking about wanting a new mattress. He was doing some research on his breaks at work and would chit chat about what he found. 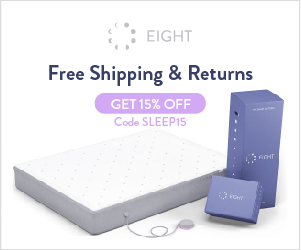 Then suddenly an email came into my inbox and its the “Eight” or “Smart Eight Mattress” and I did all my reading/research, and next thing I know an eight mattress is at our front door. I was so stinking nervous about a new mattress, especially a memory foam one? I mean I am all about springs and firmness etc. I have loved our pillow top mattress and we have had it since marriage with no problems what so ever. I mean we would stay in hotels or at family’s homes and nothing was ever better then your own bed aka your own mattress. I was also nervous about this eight mattress because nobody is pickier about their toilet paper, socks, and mattress… then my husband. Ironically their all things that offer cushion and softness LOL. Well our eight mattress came as I said earlier, and we pulled it out of the box laid it across our box spring and cut the plastic wrap off of it. We watched it puff up and grow in just a minute. We were so excited for a new mattress. YAY! We put our mattress cover on, our sheets, and went to bed that night. Guess what? we over slept and had to scram to get the kids fed and out the door for school. HA! we got more then “8” hours of sleep. I tossed and turned on my other mattress, all the sticken time. I was miserable! Not only did I not toss and turn, but you don’t feel the movement of this eight mattress and the “4” foam layer’s which let me share all the amazing details with you now. Eight’s research shows that people who sleep on foam mattresses get the most deep sleep: 21.3% deep sleep per night compared to 19.8% deep sleep on latex, 18.8% on gel or gel-infused layers, and 10% on innerspring. The Eight Mattress is unique in that it has not three, but four foam layers for your optimal relaxation. Eight’s bed has four high density foam layers that provide the perfect amount of support. This is the bed for all the Goldilocks in the world; it is not too firm, but not too soft. It forms to your body shape, but bounces back. It is supportive with no pressure, and cozy without being too warm or cool. Each of the four foams are CertiPUR-US certified. The high density of the foam in Eight mattresses sets them apart from competitors. This allows you to get the most comfortable, undisturbed sleep. The Eight foam mattress does not transfer movement, so it is ideal if you sleep with a partner or pet who tosses and turns during the night. Eight’s mattresses are manufactured in America. Compared to other top brands, their foam mattresses are smartly priced.